We are excited to announce the arrival of the new RCU Marketplace! With this update, you will gain access to more formatted listings, advanced search options, and popular sorting features. 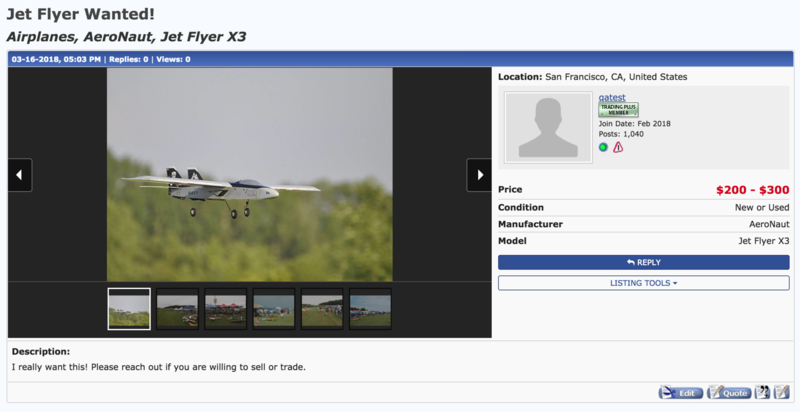 It is now easier than ever to list your RC product for sale with an updated Marketplace listing. You can still specify all the important details including the Product Type, Manufacturer, Model, Item Condition, Price, and Location. Potential buyers can then sort by these features and help find a new home for your product quicker. The new photo viewer also makes it easy to upload and view all of the images of your product. Let other users know what you are looking for! You can specify the RC product you want, and sellers can browse through the "Want" category to ensure they will find your listing. With the improved Homepage & Search Result Featured (used to be Turbo Featured) and Emphasized (used to be Highlight/Bold) listing upgrades, you can make your listing stand out like never before! We know there were other upgrade options in the old MarketPlace and we will be working hard to bring those to the new MarketPlace as well. We have improved the membership plan structure as well! See details below. 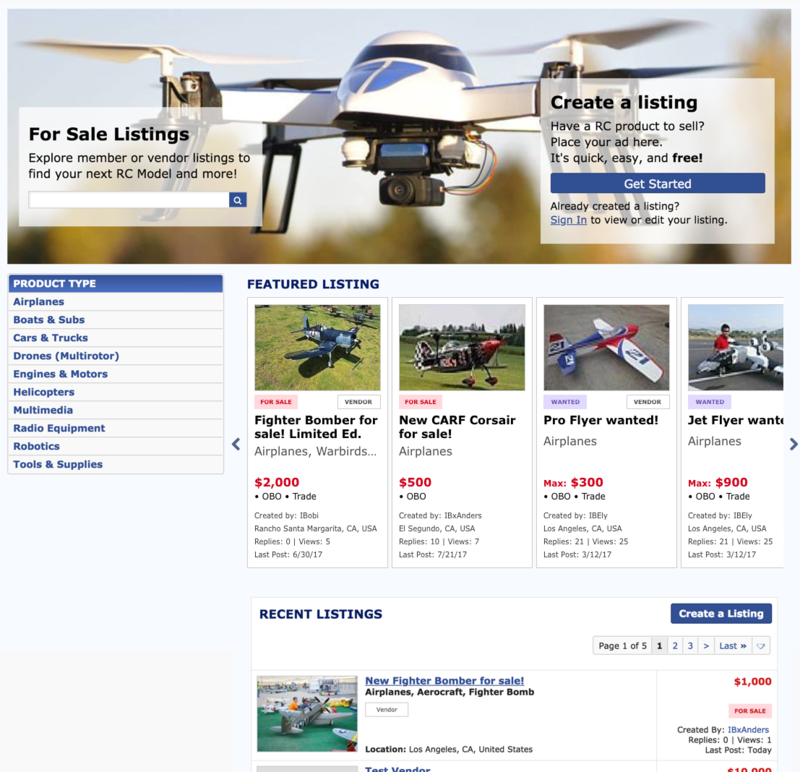 WHAT ABOUT THE CURRENT CLASSIFIEDS FORUMS? Existing listings won't get lost in the shuffle. 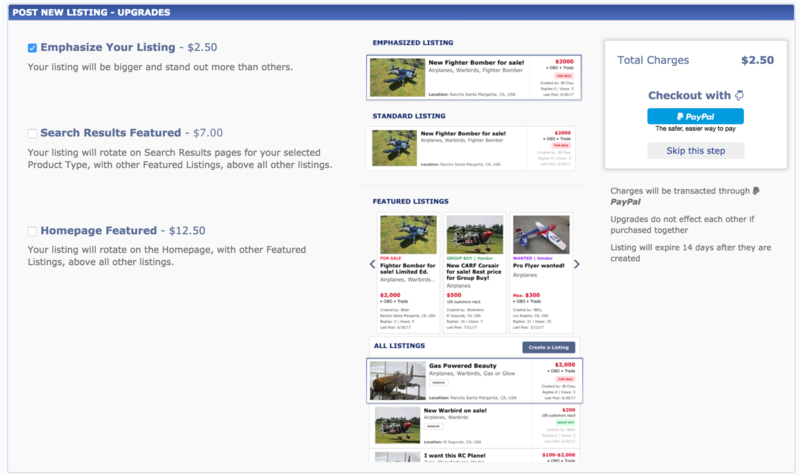 To help transition into our new classifieds section, we will leave all current listings in the old MarketPlace. Feel free to reply to listings you may be interested in and look through what is currently available. However, please note that the new MarketPlace is the only place you can post a new listing. Once the existing listings expire (approximately 2 weeks), the old MarketPlace will become a read-only archive. RCUniverse.com is one of the first communities to test this all-new Marketplace, and we will be taking into account your feedback to continuously improve upon it. Report any issues and leave comments below, right here in this thread. Thanks all! We hope this will be a massive improvement in how ads are placed and how items are bought and sold here on RCU. Please let us know if we can help in any way. Nice! But, what happens to our NON refundable yearly $10 a year that has to be on account to advertise? Will you finally keep the RCU homepage RCU Market Place up to a daily date? It has been the same for more then a year now! I am sure there are other things that I am missing. It is a nice way for you to make more money from the website, beside the bombardment of advertisement that we see from the other sources of money for you and RCU. Dan, I am not sure what you mean...? I'm completely lost. The new marketplace has absolutely left me with no understanding of how to find listings. I can click on airplanes and I see 6 listings with no way to filter it to just the areas of my interest like it used to be. Things just keep getting worse with RCU. No wonder there've been so many deserters. Here's another. Sayonara. Adieu. Adios. Auf Wiedersehen. Au revoir. Bye-bye. Ciao. Farewell. Goodbye. Good day. Shalom. So long. Tot ziens. Then you can use the search bar, or you can click the Product Type, and that opens a filter window with all the choices. Do you have any specific questions or concerns? What do you find confusing? When I click on a category I see only one page with very few listings. seems very slow to respond. Just days ago there were pages and pages of radios today only 4 or 5 listings. airplanes the same way. Last edited by sierracharlie; 03-23-2018 at 11:05 AM. Reason: spelling. Still confusing. How do you just pull up jet ads only? airplanes is a rather large product type, when compared to being able to get just jets only in the old version. some more sub headings under the current type would be a good thing. As per our notifications (see the global announcements all over the site), we currently have 2 marketplaces up. 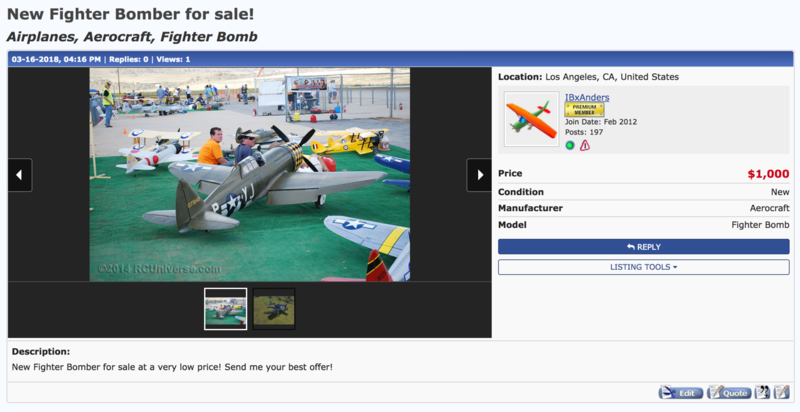 You can find both under the BUY & SELL pulldown. Agree. RCU you cannot just group airplanes. Way too large. You need sub product type if you are going to keep this format. Go and copy the sub forums as they are now and list them as sub product type depending on product type selected. You should be able to do a keyword search for "jet" or "jets" but I see that that is not working right now -- may be a bug, I will investigate. I am going to work with my developer to try to get some more granular search fields. Thank you guys! We will work on this! Thank you. Not a fan at all. The "since last visit" button will be missed. This is a terrible new design for RCU's buy and sell section. How do you expect people to go through thousands of listing to find what they like. Forget the "FILTER" button and put back the SUB-CATEGORIES. There was NOTHING wrong with the old design. Why do you guys mess with something that is not broken. Don't get it. Go back to the old Marketplace. This new thing is completely ridiculous. The manufacturers list is something from the late 90's. Reverse course RCU, you've made a grave mistake. How do we make offers? where did the ratings go ? Last edited by amilcar; 03-23-2018 at 02:09 PM.